Former Sierra Leone captain Ibrahim Kargbo has retired from international football with immediate effect. The 33-year-old defender, who is playing for English non-league side Thamesmead, says his decision relates to his indefinite international ban. He was suspended by the Sierra Leone Football Association over allegations of match-fixing over a year ago. 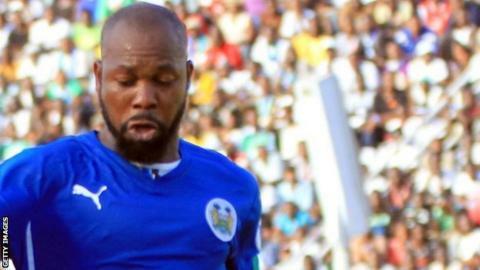 "The feeling and emotion are longer there, so I'm moving on with my life," Kargbo told BBC Sport. Kargbo was banned alongside Ibrahim Koroma, Samuel Barlay and Christian Caulker - all four accused of attempting to fix a 2010 World Cup qualifier against South Africa in Pretoria in June 2008. The quartet have protested their innocence and Kargbo is angry that he has not been cleared by an investigation. Former Sierra Leone captain Ibrahim Kargbo explains why he has retired from international football. "I'm quitting because of the suspension," Kargbo told BBC Sport. "I'm no longer going to play for Sierra Leone. It's not going to happen any more. "It's not fair because it's now 15 months since the SLFA suspended us and they have not yet started investigations. "Fifa didn't ban us from playing club football but I have lost contracts in England, China and Finland because of the match-fixing allegation. It has affected me greatly as it has stained stain my career. "I'm leaving with a bitter heart and the feeling in me for my country's national team is bitter because I have been treated unfairly. No one is standing for us to fight for justice." "I have worked for Sierra Leone, I have helped my people, so I don't deserve this. It's hard because this is not the way I wanted my career with the national team to end." The SLFA secretary general Christopher Kamara says the matter is no longer within the governing body's control. "I don't have anything to say on this issue because we have set up an independent investigation committee headed by Rtd Major Paolo Conteh to investigate the match-fixing allegations," Kamara told BBC Sport. "The matter is in the hands of Conteh who had visited the Fifa headquarters on the issue. I can't make any statement." The ban was imposed by both the SLFA and the Sierra Leone Sports ministry but the latter lifted the suspension. Kargbo is also being investigated by Dutch football authorities for allegedly fixing matches when he was playing for Williem II. He has denied the allegations. He made his senior international debut for Sierra Leone against Ghana in 2000 in a 2002 World Cup qualifier in Accra and took over the Leone Stars captaincy 10 years later after former Inter Milan and Monaco striker Mohamed Kallon relinquished the position. His last appearance for Sierra Leone came against Equatorial Guinea in a 2015 Africa Cup of Nations qualifier in Freetown.